Have you been apple picking this month? Well, if you haven’t and you can, I highly suggest you take advantage of the nice weather and go grab some of fall’s bounty. Then, once you have baskets full of apples and you are wondering what to make with them, come home and make these caramel apple enchiladas. You’ll thank me…I promise. 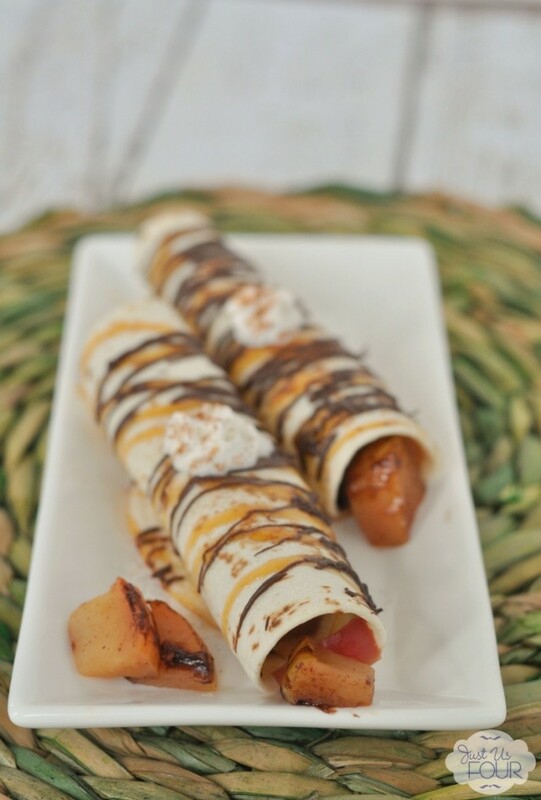 These enchiladas start with fresh apples that are cooked in a delicious cinnamon sugar mixture. 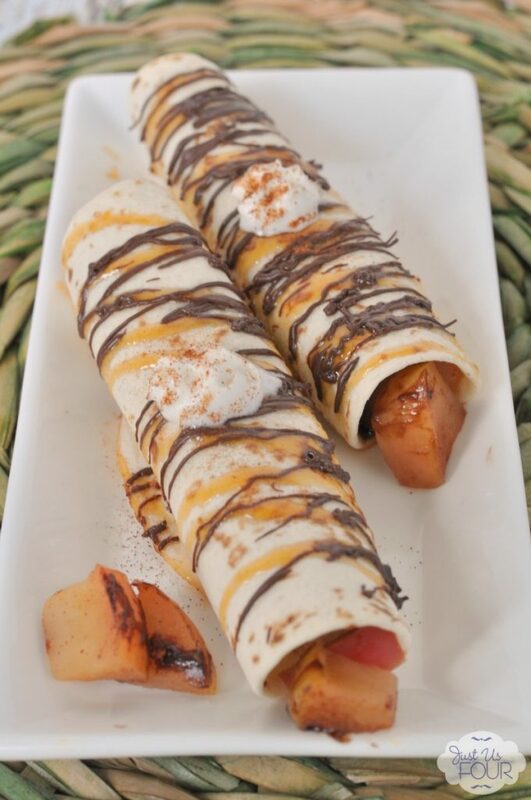 Then, you roll them up with Nutella laced tortillas and top them with caramel and chocolate. 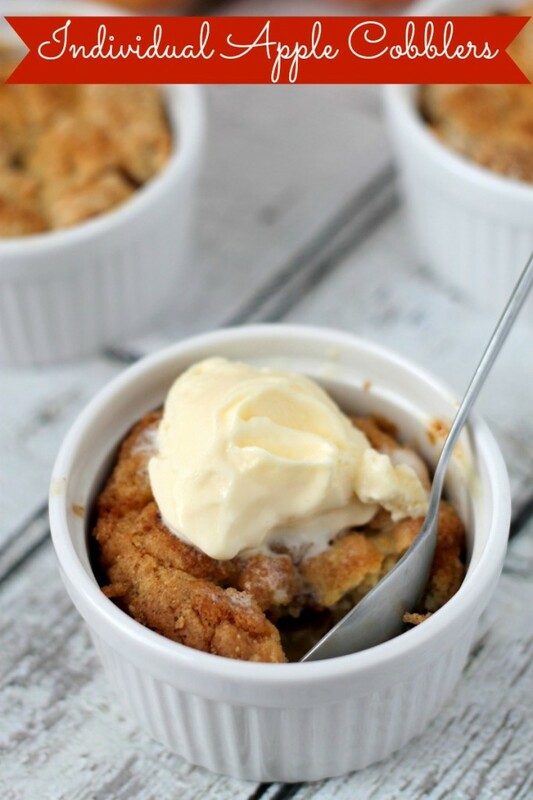 I can’t think of a better fall dessert. 1) Add apple juice, sugar, brown sugar, cinnamon and cloves to the a large pan. Bring to a boil and add apple pieces. Reduce heat and simmer for 5 minutes or until apples begin to soften. Remove from heat. Stir in 1/4 cup caramel sauce. 2) Preheat oven to 350 degrees. Spray a 9×13 baking pan with nonstick cooking spray. Set aside. 3) Divide Nutella evenly among tortillas. Spoon 1/4 cup of apples into each of the tortillas and roll up. Place rolled side down in prepared baking sheet. 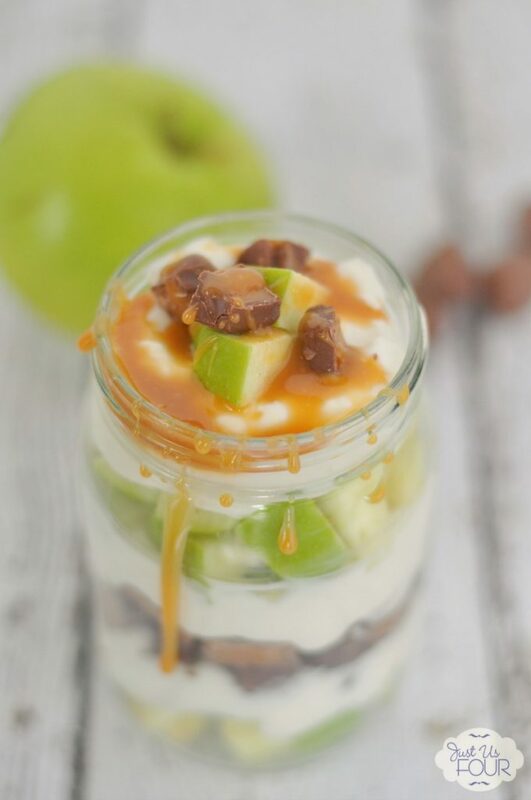 Drizzle with remaining caramel sauce. 4) In a small bowl, combine chocolate chips and oil. Microwave in 30 second increments, stirring between each one, until chocolate is smooth and melted. Drizzle over tortillas. 5) Cover with foil and bake for 10 – 15 minutes or until heated through. These caramel apple enchiladas disappeared the moment I pulled them out of the oven. Plus, they left our house smelling amazing too which was a total bonus. What are you making with apples right now? 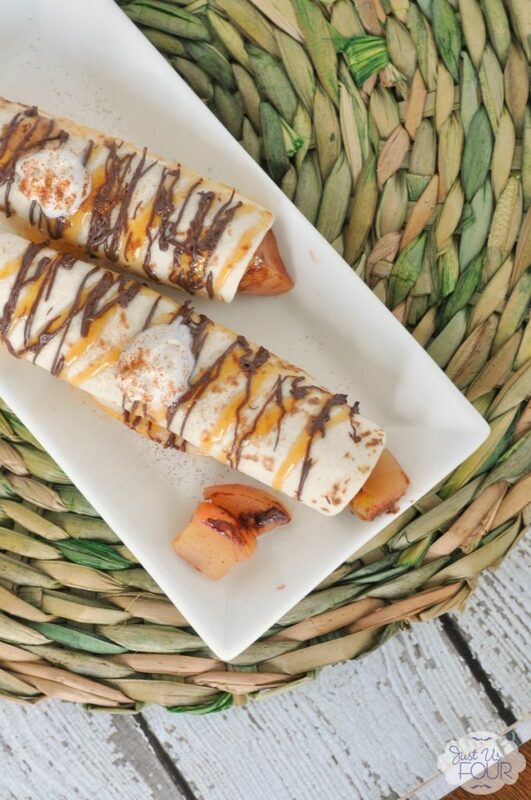 Have you ever tried dessert enchiladas? Add apple juice, sugar, brown sugar, cinnamon and cloves to the a large pan. Bring to a boil and add apple pieces. Reduce heat and simmer for 5 minutes or until apples begin to soften. Remove from heat. Stir in 1/4 cup caramel sauce. Preheat oven to 350 degrees. Spray a 9x13 baking pan with nonstick cooking spray. Set aside. Divide Nutella evenly among tortillas. Spoon 1/4 cup of apples into each of the tortillas and roll up. Place rolled side down in prepared baking sheet. Drizzle with remaining caramel sauce. In a small bowl, combine chocolate chips and oil. Microwave in 30 second increments, stirring between each one, until chocolate is smooth and melted. Drizzle over tortillas. Cover with foil and bake for 10 - 15 minutes or until heated through.